Cinnamon is a spice that comes from the branches of wild trees that belong to the genus “Cinnamomum”, it’s one of the oldest known spices, sprinkled on toast and lattes. But extracts from the bark of the cinnamon tree have also been used traditionally as medicine throughout the world. Take a look at the health benefits of cinnamon. Numerous studies have found that cinnamon may have a beneficial effect on blood sugar, making it a great choice for diabetics and hypoglycemics alike. One theory is that cinnamon increases insulin action. Also, people who have been prescribed medication to manage their blood sugar should not reduce or discontinue their dose and take cinnamon instead, especially without speaking with a doctor. Some people claim that arthritis patients may take daily, morning and night, one cup of hot water with two spoons of honey and one small teaspoon of cinnamon powder, if taken regularly even chronic arthritis can be cured. Others claim a cinnamon oil based massage oil helps ease the pain. Most of the evidence that cinnamon helps arthritis is from personal testimonials. What we do know is that cinnamon has high levels (73% DV in two sticks of Cinnamon) of Manganese which is used to build bones, blood and other connective tissues, according to the University of Maryland Medical Center. The body needs manganese for optimal bone health, so people who are deficient in the mineral are more likely to develop osteoporosis. Read more about natural remedies for arthritis. At the first sign (within 5-10 minutes) of sniffles or an itch in your throat take some cinnamon tea or cinnamon stick tea. It is said to stop an impending illness in its tracks. Add one to two teaspoons of ground cinnamon to a steaming hot cup of green tea or cider. You can also add lemon juice to help combat a respiratory infection. Here is the Home remedies for Flu and Cold, or you are more interested in Home remedies for cough. Cinnamon holds promise for various neurodegenerative diseases, including: Alzheimer’s disease, Parkinson’s disease, multiple sclerosis, brain tumor, and meningitis, according to a study authored by Dr. P. Zoladz, simply smelling cinnamon can boost cognitive processing. Chewing cinnamon flavored gum or smelling fresh cinnamon has an impact on stimulating brain function. 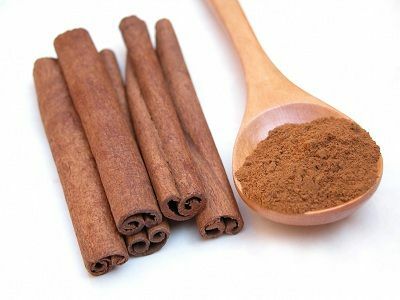 Cinnamon’s anti-clotting activities have been shown to prevent the collecting of blood platelets, and it can improve the flow of blood. Therefore, it may reduce the risk of blood clots and benefits your cardiovascular health. Don’t consume more than the recommended amount of cinnamon a day, especially if you have a blood disorder. High levels can lower your platelet levels, which can create uncontrollable bleeding. If having surgery, cease using cinnamon in medicinal amounts at least one week prior to any surgery, to avoid blood thinning complications. It’s been proven effective for menstrual cramps. Cinnamon contains a natural chemical called cinnamaldehyde, which studies show increases the hormone progesterone and decreases testosterone production in women, helping to balance hormones. Additionally, the spice provides an excellent source of dietary fiber, calcium, and iron, as well as manganese, which may also help relieve the symptoms of menstruation. Note: you should not consume more than 11 mg of manganese per day (about 12 cinnamon sticks) according NYU. Preliminary lab and animal studies have shown that cinnamon has powerful antifungal properties. It’s active against Candida albicans, the fungus that causes yeast infections and thrush, and Helicobacter pylori, the bacteria responsible for stomach ulcers. Mix cinnamon oil with hydrogen peroxide and spray your cutting board and kitchen sink especially after you have cut meats. Spray it in your refrigerator. It’s safe and natural. Its powerful anti fungal properties are also the perfect natural alternative to killing the athletes foot fungus. Cinnamon may be a promising solution in the treatment of Tumors, Gastric Cancers and Melanomas. Research in Japan and Australia has shown the combination of honey as at least an effective adjunct for treating some cancers, perhaps even a cure. The dosage for the cancer patients was one teaspoon of cinnamon with one tablespoon of honey three times a day. Now, this said, we are absolutely not advocating you start guzzling the cinnamon – as it has been found to be toxic in large doses. Cinnamon contains small amounts of coumarin, which can cause blood-thinning or liver problems in large amounts. Consume between 1 to 6 grams of cinnamon a day to experience the health benefits from cinnamon. In addition, Cinnamon — as a treatment — is not recommended for children or for women who are pregnant or breastfeeding.